The story of Holy Trinity’s over one-hundred year existence is a story of the miracle of God’s grace. Since God chooses to work through human agents, it is also the story of the self-sacrifice and dedication of many faithful people. The parish’s dedication, Holy Trinity, attests to its Low Church Evangelical origins, a tradition maintained to this day. Since its beginning as a suburban church in 1899, Holy Trinity has grown with the South Granville neighbourhood of Vancouver. Originally, the area was ‘frontier’ territory, on the edge of virgin forest. Now, South Granville may be regarded as an extension of downtown. The first service was held on Sunday afternoon, 21st May 1899, in Fairview School, situated at the corner of Granville and Broadway. Upon arrival of the first Rector, the Revd John Antle, in October 1899, a disused school in the fourteen-hundred block of West 8th Avenue was rented and, after some renovation, used for church services and Sunday School. Holy Trinity soon found the old school house too small, and in 1900 a church was built by voluntary labour on Pine Street between 7th and 8th Avenues. Services were first held there on the 24th Sunday after Trinity, 25th November 1900; the Bishop of the Diocese, the Rt Revd John Dart, preached in the morning, and the Revd LN Tucker, Rector of Christ Church (then Vancouver’s leading Evangelical parish), spoke in the evening. Registers show that a typical Church of England service pattern was established early in the parish’s history. There were normally three Sunday services: 8am Holy Communion, 11am Morning Prayer or Holy Communion, 7.30pm Evening Prayer; and a midweek service. The Rector penned a bold heading in the register between the final service of 1900 and the first entry for 1901: “THE TWENTIETH CENTURY AFTER CHRIST”. On New Year’s Day 1901, there were fourteen communicants at 8am, even though there is an accompanying notation: “Heavy snow”. Tough people those early parishioners! And they had to be, for times were hard: of the first seventeen funerals, six were of children under six years old. On 23rd January 1901, the death of Queen Victoria was recorded; but parish life went on. On Sunday 27th January, the church was in mourning, but the main service included the presentation of Sunday School prizes, and a baptism. The first confirmations were on 28th July 1901, with five candidates. In his first annual report (1906), the second Rector, the Revd Havelock Beacham, expressed “very clearly and strongly the necessity for an enlargement of the church” to accommodate the increasing congregation, and two vestries were added to the west end. 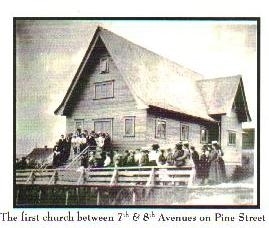 Two years later, the building had again become inadequate, and plans were made to build a new church on lots acquired from the CPR at the corner of 10th Avenue and Pine Street. The new church building was completed in October 1912 and remained Holy Trinity’s home until 1993. The Revd Norman Larmonth, fourth Rector (1936-1941), had worked in missionary areas of central British Columbia. His emphasis on missionary endeavour, led to large increases in parochial and missionary giving. Records from 1946-1952 tell of the Chatelaine Club: “We would gather men’s pants and shirts, also ladies’ dresses or remnants of material, in order to make children’s clothing. We would make little shirts for boys, blouses for girls and baby clothes. Meeting twice a month in our homes in order to cut out, sew, put on buttons, iron, press and pack the various items; everyone helped in some way.” An interesting precursor of today’s Tumaini Fellowship that meets monthly to knit clothes and blankets for children in Africa. A special Teaching Mission in March 1957, conducted by Bishop RJ Pierce of Athabasca and Bishop SC Steer of Saskatoon, was well attended and influenced church life. Congregational growth in the late 1980s led to the decision to move into a larger facility. The last service at 10th and Pine was held on Easter Day (11th April) 1993, and on Easter Monday the building was deconsecrated. The historic (1911) Chalmers site at 12th and Hemlock became Holy Trinity’s home in 1994. On 20th February, the congregation processed from the old site to its new location. The consecration service was held on 8th May. The Chalmers Building was designed by Samuel Buttery Birds (1871-1960), who was asked by the church’s building committee to produce a church “in keeping with the fine residential section of the city.” The cornerstone was laid on 14th October 1911. The Revd Roger Simpson served as Rector 1995-1999. There was an emphasis on evangelism and ties with Regent College were strengthened. In 2000 the Revd Colin Goode became Rector. A fine landscape painter, he developed solid connections with the Christian art community and a number of musicians, actors and visual artists made Holy Trinity their church home. The Revd John Oakes, who was Rector from 2002 to 2012, led Holy Trinity through a difficult period with wisdom, patience and firmness which enabled it to remain a strong Evangelical voice in the Diocese. In 2014 the Revd Karl Przywala became Rector; under his leadership Holy Trinity has strengthened its Christian education programme and outreach, including Film & Faith evenings, monthly Share & Prayer and Saturday afternoon Café Church, cell groups and weekly morning Bible Study. Neoclassical in style, it features an impressive dome and a Corinthian portico. Its fine acoustics made it a venue for many concerts broadcast by the CBC in the 1950s and 60s. Before moving in 1994, Holy Trinity undertook extensive renovations including the construction of the Pacific Theatre space and the reworking of the Sanctuary.